Firmware release 13 is available now to download for the automation system PSS 4000, containing numerous new functions. With the online change function it is now possible to make individual program changes on the control system. This will save you time, because there is no need to compile and load the whole program during commissioning. 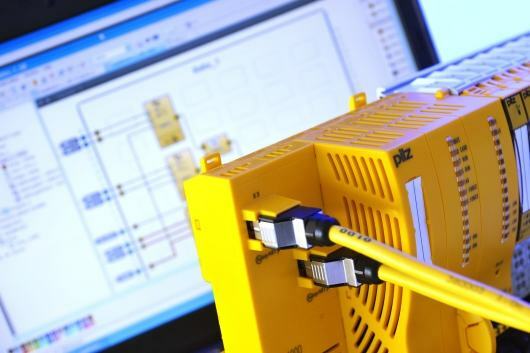 As the automation system PSS 4000 treats safety and automation functions in the same way, for the first time at Pilz the online change is now also possible for the failsafe section. With Release 13, the PLC control system PSSuniversal PLC offers a device interface for standard communication with ProfiNET networks. ProfiNET is integrated into the control systems as a communication stack. Through a special configuration in PAS4000 it is possible to operate various communication connections with the same hardware (UDP raw, Modbus/TCP, Ethernet/IP etc., and new: ProfiNET). A control system PSSuniversal PLC can be used for universal access to various communication systems. The configurable connection structure SafetyNET p FS offers another advantage. It ensures that the system is automatically reconnected if the SafetyNET connection is lost. For even greater safety, the new release enables pulse stretching and pulse delay in the compact module Fast Control Unit (PSSu K F FCU). As a result, even very short pulses can be safely recorded and processed. Saves time during commissioning: For the first time it is possible to build individual program sections and function blocks, even in the failsafe section, without having to rebuild the entire project. Number of device types is reduced due to standardisation: Through configuration in PAS4000, one control system can be used for various Industrial Ethernet communication protocols, such as ProfiNET. Greater productivity: Should a SafetyNET p connection be interrupted, the system re-establishes the connection automatically.